Cebu Pacific Promo Fares 2019 to 2020: Promo Fare of P99 As the cheapest you can get! 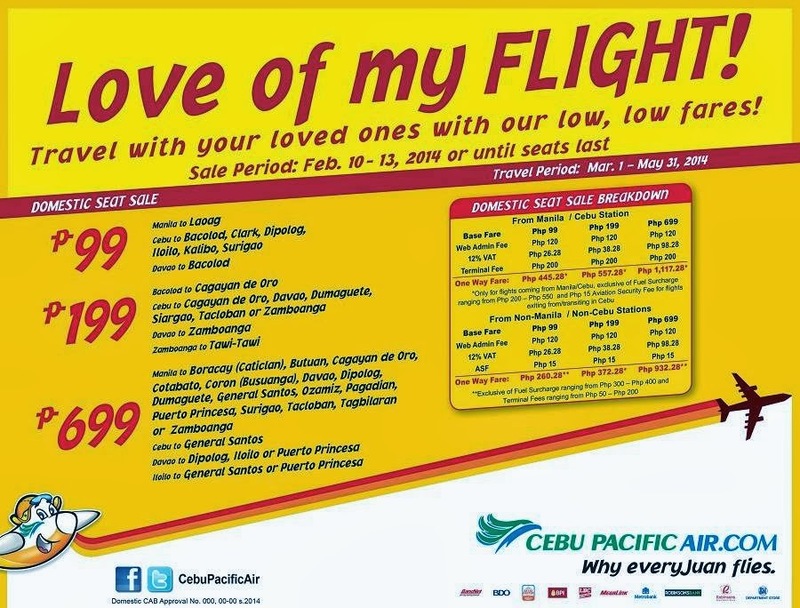 Cebu Pacific Promo Fare: Love of my FLIGHT! Travel with your loved ones with our low, low fares! Our latest #CEBseatsale is up. **Only for flights coming from Manila/Cebu, exclusive of Fuel Surcharge ranging from Php 200 - Php 550 and Php 15 Aviation Security Fee for flights exiting from/transiting in Cebu. Quoted DOMESTIC one way fares are inclusive of Base Fare, Php 120 Web Admin Fee, 12% VAT, Php 200 Terminal Fee for flights transiting in or exiting from Manila/Cebu station and 7 kg hand-carry baggage allowance, but exclusive of Fuel Surcharge ranging from Php 200 – Php 550, Php 15 Aviation Security Fee for flights coming from Cebu and check–in baggage. Terminal Fees ranging from Php 50 – Php 200 for flights originating from non-Manila/non-Cebu stations must be paid at the airport. Please note that booking fee rates range from Php 120 –Php 200 depending on purchase channel. For your convenience, flight changes, availing of prepaid baggage allowance for check-in baggage and web check-in service can be done up to 4 hours before your scheduled flight. • Promo Price is for the BASE FARE of a single trip ticket only. • Passengers are allowed to hand carry luggage up to 7 kilos only. Check in Baggage Service service is availble but with a fee. • Tickets can’t be re-booked or be used by another person.